And I owe it all to you-u-u-u-uuuu! 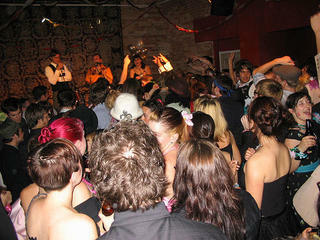 Saturday was the Fake Prom at the Gladstone Hotel, and it was such fun. This "perversion of the hallowed tradition of prom" was an evening of guilty pleasures: cheesy music, ugly-on-purpose outfits and drunken debauchery. Most girls were referencing early 80s Molly Ringwald-era prom fashions, with cascades of frills and flounces, clip-on bows, sequins and pastel sateen. The boys looked to Napoleon Dynamite for inspiration: snug polyester or tweed suits were paired with frilly shirts and wide ties. It really made me happy to see everyone's creativity. 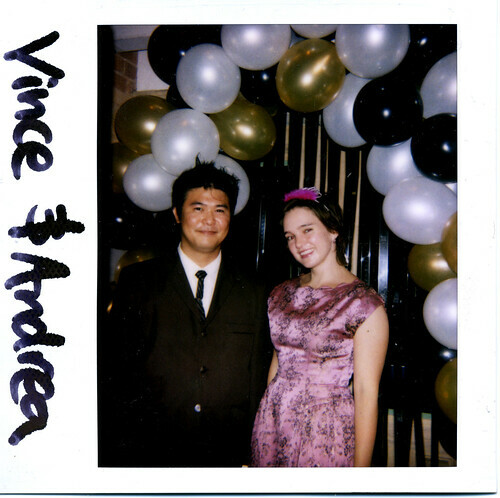 As for my date and me, we went for a more vintage late 60s look, because we love any excuse to dress like this. Aren't old clothes fun! Don't quite get the point of it all? Here's the party line: Not sanctioned by any official scholastic institutions or learning organizations, Fake Prom is more of an excuse for twenty-something hipsters from the indie-rock and punk communities to dress up for an evening of counter-culture fraternization. All of the traditional conventions of a real prom are present at Fake Prom - DJs spin records while well-dressed revellers get their portraits taken under the arches and cut loose on the dance floor. But the chances that a football player and cheerleader will win the title of Fake Prom King and Queen are slim compared to those of a nerdily-spectacled media-blogger and a tattoo-sleeved zine-maker. Andrea, I checked out those other photos of your fake prom, and you look so great! Your dress is gorgeous. Looks like you had a good time, too. that's an amazing dress. where'd you get it? and i swear my dad had a suit just like that, lol.